During the early years of stereo, Sidney Harman and then-partner Bernie Kardon manufactured a cheap line of stereo electronics that—to crib a phrase—didn’t get no respect. Citation was the brand name of HK’s first “serious” product, a preamp that not only got lots of respect, but is now considered a classic. The name became synonymous with high-performance audio until the line was discontinued in the early ‘70s. Now the moniker has been resurrected for Harman’s new line of high-end home- theater components, formerly sold under the Fosgate name. The heart of the system is the 7.0 processor. The unit’s front panel is disarmingly simple and refreshingly unobtrusive in a darkened room (the display winks out after a few minutes if no controls are used). Yet, in spite of its simplified façade, the 7.0 still manages to pro vide all the basic operational controls; you’re not dead-in-the-water if you mis lay the remote. The 7.0 is equipped with eight audio/video inputs, making it one of very few surround processors with enough inputs to suit most users. All eight accept composite video signals, and four can also be reconfigured as S-video inputs. There are a total of ten audio outputs: Front Left, Front Center, Front Right, Side Right, Back Right, Side Left, Back Left, Left Sub, Right Sub, and Mono Sub. Ser.#s: 000475, 000476 Price: $1150 ea. There are also two main video outputs— one always on with an on-screen display, the other with defeatable on-screen display In addition, there are two audio record outputs, one fixed level and one variable-level; these can be used for recording or secondary zone feeds. An additional set of composite and S-video outputs accompany each of the audio record outputs. The front channels arc entirely analog—there is no A/D and D/A conversion. This avoids the common surround-decoder problem of making all input signals sound “digital.” The front- channel signals are treated very benignly aside from some soundstage distortion (more on this later). The 7.0 is entirely menu driven. There are basically two sets of menus, which can be viewed on the video screen (optionally) or on the 7.0’s front- panel display. The User menus are for minor parameter changes such as surround balance and mode customization. The Setup menus contain parameters that are mandated by such things as loudspeaker lineup, speaker types, and listening room shape. These include a calibration mode for setting the proper THX level and balancing-out channel levels. Calibration can be done manually or automatically with a special micro phone (supplied). The 7.1 and 5.1 amplifiers far surpass THX’s minimum requirements for frequency extension, current capability, and distortion content. Both are rated from 3 to 200,000 Hz, deliver 3 times their single-channel power when bridged, and have a 0.O3Ws distortion specification at rated output. Impressive indeed! Both amplifiers are equipped with time-delayed trigger inputs and outputs. A corresponding trigger output on the 7.0 allows you to automatically turn on the amps in sequence from the processor’s AC switch. Two additional trigger outputs on the 7.0 are user-programmable; they might be used to lower a motorized screen when a video input is selected, and raise it when the system is shut down or another source selected. 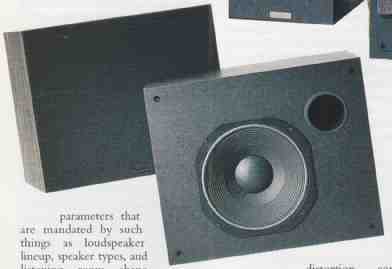 Except for the surrounds, the speakers are standard THX types. The fronts use a vertically configured, mirror- image driver array with two stacked tweeters to produce THX’s mandated narrow vertical and broad horizontal dispersion. The (unpowered) subwoofer are designed to cross over at 80 Hz and extend to around 20 Hz at full 105 dB output level. 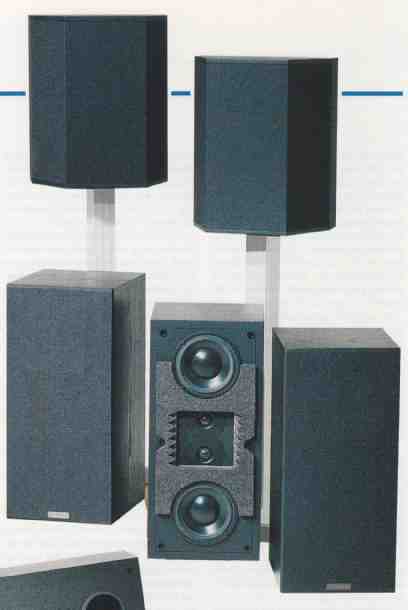 The surrounds may be unique in that their two sets of opposite-firing speakers have separate input connections. This allows them to function either as a conventional wide-angle monopoles or as THX-style figure-8 dipoles, depending on whether they’re connected in- phase or out-of-phase. Does it matter? In a word, yes. The most common use for the surround channel is ambient effects—rain, environmental sounds, the omnipresent hum of the starship Enterprise. These should seem to emanate from all around you; they should not be “localizable” to a specific location. On the other hand, some surround effects are intended to be readily localizable. Specific events such as door slams, people talking, gun shots, etc. 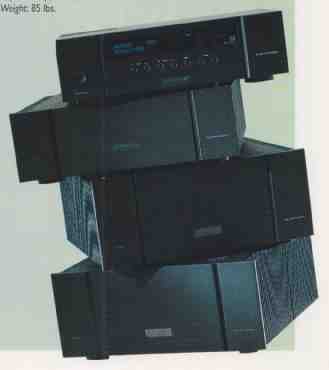 are better reproduced by conventional monopole speakers. This is especially true with AC-3’s discrete stereo surrounds; the filmmaker or music recording engineer may have worked very hard to place an effect at a particular point in the rear soundstage, and the diffuse character of dipoles won’t help matters. With the 70 processor and the Model 7.3 surround speakers, you can have the best of both worlds, but more on this later. My review system was installed by Citation’s Charlie Wood, who made it look ridiculously simple. The auto-calibrate microphone was dead right out of the box, so he calibrated the system manually, using the 7.0’s internal test signals and my el cheapo Radio Shack sound pressure level (SPL) meter. Everything was working fine when he left. The next day, I ran into a problem. Even with the volume set a little above zero, the sound was barely audible. I called Charlie and learned that zero level meant different things to us. I was talking Do/by zero—the volume setting at which a THX laserdisc plays at the director’s intended level, which is usually LOUD. Citation uses system zero—the setting where the volume is all the way off. Turning the processor’s level up to 43 dB—way above the self-destruct level set ting of a Dolby-zero system—produced the desired “reference” volume. Wood said they opted to do it this way because most consumers don’t under stand about zero level and would be con fused by the concept. Maybe, but counting decibels from all-the-way-down makes no sense. On a dB scale, +6 dB is supposed to be twice the original level, but nothing times 2 is still nothing. And I don’t see why a “normal” volume setting of 43 dB would be any more meaningful to the average consumer than 0 dB. You can set the turn-on level of the 7.0 to any thing you wish, to eliminate the kind of surprise I got, but it seems to me it would make sense to at least offer Dolby zero as a configuration option for those of us who are more comfortable with it. Several days later, the replacement auto- calibration mike arrived and I turned it loose on the previously adjusted system. Autocalibration resulted in level settings that varied considerably from the previous, manual setup: About 4 dB higher on the fronts and surrounds, and 2 dB on the subwoofers. The resulting sound was less than satisfactory. At Dolby/THX reference listening level, the volume was much too high even for these callused ears, the bass was rather thin, and the surround- channel balance was skewed toward the tight. My advice: Buy a Radio Shack SPL meter (the $35 analog model 32-2055, not the less discriminating digital model) and calibrate the system in the good old- fashioned way. Other equipment used for this review included a Pioneer Elite CLD-99 laserdisc player, a MicroMega T-DAC digital-to-analog converter, a Sony DTC 2000ES DAT recorder, a SOTA Cosmos turntable with vacuum hold down, a Well Tempered Arm, an Ortofon SL 3000 cartridge and its mating step-up transformer, an AmPro 2000 video projector and DWIN LD-2 line doubler, and a Stewart 6-foot projection screen. Audio interconnects and speaker cables were by Monster. Software included a handful of recent blockbuster laserdiscs, a compilation of digitally copied music selections and soundtrack excerpts on DAT, and some stereo LPs of varying vintage. The 7.0’s video switching was completely transparent; there was no visible difference between using it and connecting directly from the laserdisc player to the DWIN. Sonically, the Citation was the best THX system I’ve reviewed to date. Aside from THX’s usual strengths: robust, natural midrange; immense, effortless dynamic range; and deep, solid bass, it also had the smoothest, most extended high end 0 any previous system. Bass quality was generally excellent, although the pitch articulation was not as good as the best I’ve heard in my listening room. The subwoofer blend with the satellites was superb; at no time did I hear even a hint of transition as scales passed through the crossover region. The Citation system never showed a trace of steeliness, even at almost ear splitting levels. If anything, the 5- to 7- kHz range sounded a little reticent, resulting in a slightly veiled, darkish character that was consistent from program to program. With laserdiscs, abetted by the distraction of a video image, there was little to complain about soundwise. Dia log intelligibility and dynamic range were excellent, and very high volume levels were handled effortlessly. There was no perceptible compression of high- volume passages, giving the impression that there was a super-fast, super-clean volume expander in use. Very few high- end audio speakers can handle real- world volume levels this effortlessly. Bass too was very impressive: deep, tight, smooth, and completely immune to stress at any sane listening volume. There were times when I felt my trouser cuffs flapping! In addition, the surround channels were dead- quiet, and the quality of sound from them was outstandingly good—some thing that can’t be said for most surround processors. That is not to say that the Citation system is without flaw. Compared to a high-end music playback system, its shortcomings were identical to those of every other THX system I’ve reviewed: it just didn’t have the resolution and high-end openness and detail that audiophiles take for granted. It was deficient in snap and speed. This did not seem to be entirely the fault of the electronics or the speakers, but was apparently a joint effort. Substituting a pair of Boulder 250AE power amps ($2850 each) for the front channel Citations improved matters, but only about half as much as I would have liked. The surround modes were interesting. THX and Dolby are self-explanatory, and both worked pretty much as expected, although the center-channel level dropped by about a decibel or so when THX was engaged. The other modes use Fosgate’s proprietary ultra-fast steering to provide a high degree of channel separation without the annoying pumping that often occurs when Dolby-type logic steering is used with non-encoded recordings like CDs. The 70-mm mode expands the normal 60-degree soundstage to about 90 degrees, without impairing center fill! The Jazz and Rock modes do likewise, but by different amounts and with different soundstage characteristics. One of the most touted features of the 7.0 is Jim Fosgate’s newly developed 6-axis mode, which delivers an honest- to-goodness stereo surround field, often producing discrete images between the rear speakers. With the front channels turned off, the difference between 6- axis surround and Dolby-based surround was nothing short of amazing. The surround sounded like a real acoustical space instead of a nebulous rear spread. The system even gave a credible simulation of sidewall imaging. At 10:42 into side one of Lady Hawk, the horses passed off the screen at the right and moved smoothly across the right wall to the back. The effect even persisted when I turned to face the side image! Try this for a quick demo. Turn off the front-channel amplifiers, stand in the middle of the room facing the rear speakers, switch to Pro Logic mode, put on a program with lots of ambient surround information, and listen to the surround image. It’s dead center. Then listen in THX’s decorrelation mode; the image is wide but it’s just undifferentiated space. Then switch to 6-axis. If you’re not wowed by the improvement, you’re not tuned-in to acoustical space. Which surround mode was best: dipole or monopole? Of the two cinema modes—Pro Logic and THX—the THX dipole configuration won hands-down for realism and emotional involvement. But 6-axis mode changed the rules of the game. Its monopole configuration and stereo surround signal gave space and envelopment to ambient sounds, and localizable direction to more specific, small-source sound effects—the best of both worlds. I ended up using 6-axis for all signal sources. There are several venue modes that can be invoked to augment any of the surround modes. These simulate various acoustical spaces ranging from an intimate night club to an arena, with varying degrees of success. The best were the small-space settings; Concert Hall and Stadium had far too much and too pro longed reverberation to be useful. The music surround modes are pre programmed with venues that are supposedly appropriate for the types of music. ‘While the venues could be turned off, they would reactivate every time I changed sources or even switched briefly to straight stereo mode. There was no way of getting rid of them permanently without creating new user modes, of which there are only four available. This is clumsy and annoying. It should be possible to modify the factory modes, with an option to restore the factory settings if desired. The 7.0’s various modes seem to play games with center-channel level, too. Ideally, the sound should not change when you listen from dead center with the center channel on or off, but this was true of the 7.0 only in THX mode. In the others, including 6-axis, there were obvious changes in center level when I switched off the center speaker, and there was no way of making them sound like the THX mode. This was, in fact, my only complaint about the Citation’s 6-axis mode; it changed the soundstage width. The Citation’s calculated 8- weighted sensitivity was significantly less than the specified 91 d8/W/m, at 86 dB/2.83V/m. I suspect that this is a corollary of the frequency response, B- weighting being sensitive to response error in the upper midrange (see later). The measured electrical impedance con firmed that the 7.2 is a 4 ohm design, the magnitude remaining between 4 and 6 ohms over most of the audio band. ‘Not quite forward’ or ‘aggressive’ enough,’ said JGH of the Citation system, something con firmed by the 7.2’s on-axis responses which lacked energy in the region around 1 kHz. This ties in with the low measured sensitivity. And, exactly as Gordon surmised, there was also slack of energy in the 5—7 kHz region. Other than these small suckouts, the on-axis response was pretty flat, especially in the midrange. As with all THX designs, the 7.2’s bass rolls off earlier than expected for a speaker this size to allow for optimal matching to a subwoofer. It reached the —6 dB point around 48 Hz. The 7.2’s lateral dispersion was textbook—evenly balanced off- axis with a regularly increasing treble rolloff with increasing off-axis angle. Vertical dispersion, however, was severely restricted by the typically THX, dual tweeter, dual-woofer drive-unit configuration. You need to sit exactly on the centerline of the two tweeters to receive the full mea sure of high frequencies. Stand or sit too low, and the Citation will sound quite colored. In the time domain, the tweeters and woofers are connected with opposite acoustic polarities—not a problem—and the associated waterfall plot was very clean, contributing to the speaker’s grain-free sound. Clipping (1% THD+noise at 1 kHz), normal mode: 104 Wpc into 8 ohms, 173 Wpc into 4 ohms, four channels driven; 290 Wpc into 2 ohms, one channel driven. Bridged mode: 324 Wpc into 8 ohms, bridged to two channel mode, both bridged channels driven. While the setup menus are very logically organized and intuitive to use, the user interface is less than exemplary. The Surround controls are a defining example. Although the remote has the usual set of diamond keys for control ling Left/Right and Front/Back balance, the 7.0’s diamond buttons don’t control the surrounds unless you tell them to. If you don’t, they simply duplicate the functions of the volume control—Up or Right increases the volume, Down or Left decreases it. To adjust the surround levels, you must first press a Surround button, which presents you with the Left/ Right balance option. To select Front/ Back balance, you need to press the Down button and then the Select but ton. Only then can you use the Up or Down button to change F/B balance. But you’re not done yet. Even though the effect of the adjustment is now audible, you can’t control anything else until you either abandon the change or store it, and then back out of the menu tree to return to its top level. There is no direct access to front-channel balance, either. You have to dig into the menu system to change it, and doing so requires as many button presses as changing the F/B balance. There are no time-outs for menu displays. Even if you elect to make no changes, and then get called to the phone, the 7.0 won’t let you off the hook. The menu choice will still be waiting for you when you get back. And it won’t let you enter any other command until you work yourself back to the top level. Until then, you can’t even turn the damn thing off with its front-panel AC switch! This was only one of several irritating features of the 7.0’s user interface. Equally irksome was my discovery that the 7.0’s factory preset modes are immutable. Even though there’s a button marked Mode Edit, you can’t “edit” any of them. If you want to change something, even for just the duration of one disc side, you must store it as a Custom mode. Then you have to remember what numbered Custom but ton does what. Gimme a break! Other annoyances included the in ability to turn off the surrounds without also turning off the center, a bass control that boosts only in 3-dB increments, and---oh well, you get the point. The Citation THX system out per forms all the others I’ve reviewed (including the Fosgate, the original Snell, and the ICEF) in terms of treble extension and smoothness but, like the others, it’s still a bit of a mixed bag sonically. The Citation is one of very few home-theater systems that does soundtracks and music equally well. That isn’t to say it’s ideal for both, or even for either, just that it compromises both to about the same extent. It’s not quite forward or “aggressive” enough for soundtracks, and not rich or warm or detailed enough to satisfy high-end audio aficionados. That said, I thought the system did a very satisfying job on both kinds of material, particularly with sound tracks where the picture tends to make one less picky about the sound. I also loved the 6-axis mode. And while I was definitely aware of its shortcomings in certain areas, they were all areas of omission; they never annoyed or irritated mc. That was not the case with the Citation 7.0’s clunky user interface. Its shortcomings aren’t the kind you get used to with time. It may become more “intuitive” to use, but it never becomes any less tedious. The Citation system will provide still more aid and comfort to those who are convinced it’s impossible to get true high-end musical performance from a THX home-theater system. I don’t believe that must necessarily be the case, but I’m still searching for an exception that might sup port my rather unpopular view. Watch these pages.